This Wednesday, I’ll be releasing a book that’s a long time coming. Although I do my best not to give away hints…. I can at least tell you this. It’s a memoir. Covering my first 23 years. As you may know, it’s pretty standard for authors to contact other authors. Requesting a review to go on a book’s back cover. Or, in my case, right on the inside of the book. Ahead of the title page…. What a great opportunity for me it was! Contacting memoirists I admire. Somehow it never registered upon me. Although right on the cover of his book, it tells you: A memoir by three time Emmy Award winner. If I had known this guy was such a huge success, oy! Probably I never would have contacted him. Yet Bobby couldn’t have been sweeter to me. Never acting like a “more important than thou,” in-demand performer. More like a kindred spirit. Even the title of his memoir, “Eye to the Sky” is pretty kindred to the title that I chose for my memoir. Long story short, I want to tell you about this man. And learn more about him, myself. Here’s background on Bobby Norfolk. And you can find YouTubes galore, showing him performing. Maybe you’d like to spend slightly more than one minute on this one. Delightful! Now here’s background on what it means to be an empath. Curious what it means to do a “Skilled Empath Merge“? That last link could help. Which photo? I’ll be using the photo at the top of this post as a basis for doing this Skilled Empath Merge. Joy is the signature quality. Contagious joy. Combining great love and a strong connection to the Divine. So deeply integrated into Bobby’s humanity that it’s in his perception of everyday things, everyday people. Symbolic Size of this Chakra Databank is 29 feet. Childlike curiosity. Guiding a heart with childlike purity. Sorry, Blog-Buddies, if this Skilled Empath Merge is coming out sweet as your favorite kind of candy. If you know me, you know that flattery isn’t my thing. Nor is sentimentality. I’m just telling it like I find it. Because this beloved performer used to stutter. Not that you’d guess to hear him speak now. But that’s one of the things you can read about in his memoir. Okay, here I go, back to the Skilled Empath Merge…. Free. Joyfully and comfortably free. Beautifully connected. And what’s the quality here? More than strong and secure, that’s what. Beyond that, the quality of this chakra databank reveals something sweet. 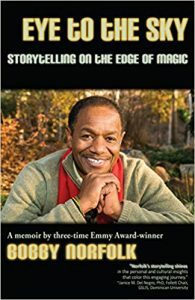 I suspect that Bobby Norfolk is one of those rare individuals who has always felt connected to God. I’m sure not in that group. However, my group is a very, very large group. Plus, we can always evolve to the point where we do feel connected. Tremendous tolerance for human messiness. That’s what I find. Plus full willingness to engage in that human mess. Along with the desire to bring love and understanding. Humbly helping to transform that mess. Aw, shucks! I thought I would like what I found. But I didn’t expect to find Enlightenment. A time when millions of people can move into Enlightenment. And do it as householders. People who are actively involved in life. Well, I did my due diligence with Enlightenment Validation. Researching more about the master storyteller. No question…. Expected or not, Enlightenment is exactly what I have found in Bobby Norfolk. Onto my Enlightenment Life List he will go! Great Rose – thank you! ETHAN and JEAN, thanks so much for commenting. Technical skill, superb coordination, clarity of speech, huge charm, and such a quality of naturalness. That naturalness is in his writing too, as though it’s the most normal thing in the world to do what he does. This was a beautiful reading, Rose! Bobby Norfolk, a delightful ray of sunshine.